In the off-season, the sleepy town of Long Beach, Washington greets you with for-sale signs and boarded-up businesses. Located just 170 miles outside of Seattle, this area feels like it’s a world away from the big-city lights. But, beyond the ghostly main drag and past the dilapidated carnival, there is something that the town’s name implies but you would never expect without a little exploring. Lo and behold, the town of Long Beach is the access point for the longest drivable beach in the United States. When thinking of beaches, you might envision palm trees, a sunny sky and white sand, but when I think of beaches, I dream of crashing waves, an overcast sky and an endless stretch of beach in front of me. I recognize that this is not the norm and I accredit it to my Pacific Northwest upbringing. The dark green evergreens and gray Pacific Ocean have a way of putting me at ease. So with this in mind, I set out to enjoy the beach like I never had before: on my motorcycle. I knew this ride would be a rewarding experience as soon as my tires hit the sand and I twisted the throttle. With my rear tire dancing in and out of traction, the daily grind from earlier in the day vanished and my mind was clear to focus on the ride ahead. 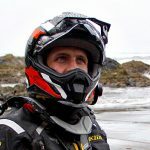 Riding through sand and surf and standing on the pegs with raindrops splattering my visor made me feel like I was riding again for the first time. I played blissfully in the sand like no one was watching and felt a smile radiating on my face. This sort of ride just felt good. It’s that simple. It was chilly, but therapeutic in a way that most people can’t understand but one that I crave. If you ever get the chance, I strongly encourage you add this destination to your list and make the trek out to the wet Washington coast. The feeling of freedom that comes from riding a motorcycle solo on the beach cannot be quite expressed in words. But, wow, it’s something that you will never forget. Photos courtesy of Joshua Parker.